Hello my name is Dean Goldstone of Goldstone Interiors Inc. I would like to share a little history on a disappearing art form that I have loved, studied and refined, the restoration process of, early silk lampshades. Silk lampshades have been around for several thousand years. There is very little recorded history on the evolution of silk lighting, though Victorians were the most noted for their use and creation of the finest silk lampshades. Oriental cultures have been using silk lamps for centuries, so one would assume that the use of this delicate art form started when Europeans began exporting porcelain and spices from the Orient, but there is no recorded history of its existence in the ships manifests. Silk lighting may have already been in common use around Europe, but doesn't exist in any of the design books or paintings of the Eighteenth century or earlier. The earliest silk shades that any records show are in catalogs from the 1870's with the use of coal oil lamps. The average life span of a silk shade is about 10 to 25 years when used with coal oil lamps, with electricity about 70 to 100 years, if looked after properly; therefore, it seems nothing from an earlier time period could have survived. Many examples I have restored in the last fifteen years, the earliest types being circa 1870 thru 1900, were all but completely disintegrated. The frames are easily dated by way of construction, the oldest frames being soldered not welded. Luckily there is a good majority of the later examples, 1900 thru 1938 that are in fair, good or excellent condition. These were often copies of the earlier shade styles, saving the upholstery techniques and textiles for posterity. This makes it possible to restore all of these shades to their former original glory, no matter how poor their condition is. Most of the textiles that were used to construct various shades are still available and being manufactured to this day, a majority of trims survived intact on the shades hiding and protecting the shades original colour, fabrics "textiles" and upholstery techniques. Some shades lost their entire colour with most of their silk and embellishments intact; while others are as good as the day they were made. Catalogs from the third quarter of the nineteenth century thru to the 1930's, plus lampshades in photographs and movies exist giving us an idea as to what was available in these time periods So we still have a fairly complete record as to what was made. And what was built once can always be restored and or re-created; it's just a mater of time, money, skill and elbow grease. My collection, and the collection of my clientele, is a working study of period silk shades, the 'Early Jewels' of lighting. Some of the worlds finest design fabrication companies such as, Tiffany & Co., Bradley and Hubord, and Frank Lloyd Write (USA), Hinks & Sons (England), are just four of the multitudes of design fabricators from their periods that used this form of lighting. Silk shades were made in almost every Western and Oriental country on the globe. The smaller independent cottage industry shade fabricators were so secretive and competitive that they hid what they were making so no one could, or would copy them. This makes it hard to follow the start of silk lighting, it is known some of the first people to start making silk lamp shades in Western culture were hat milliners, they were already skilled in making wire frames for hats and could easily transfer their skills to this new industry. Funeral parlors, with their experience of lining coffins, were another unusual early manufacture of silk shades. The Lamp Base Electricity was a big step forward in technology. When electricity came into use for lighting, after the Tomas Edison Co. invented the light bulb, the use of silk lighting became more feasible and less hazardous, and thus grew in popularity. When the first lamp bases were constructed they often left the wiring in plain view trailing up the lamp base exterior to the electrical components, so every one who came to visit could see they had electricity. The gilded age welcomed this new art form with open arms. The upper class bought lamps as status symbols that were custom made by couture design fabricators, or by the larger lighting companies. The Victorians at home were great hobbyists and would make just about anything. They started drilling holes in fine and some times ancient art, when electricity came into popularity they had to create electric lamp bases, as no form of lighting had ever existed without a flame. The items that were converted into early lamp bases were coal oil lamps, bronze figural gas lamps, vases, candelabra's, candle sticks, wall sconces - people would change just about any thing into an electrical lamp. One lamp base, in our family's collection, is an eighteenth century Arita Japanese Vase with a hole drilled out the side of the hard paste porcelain, which was then filled with plaster to add some weight. There was a growing need for lamp bases, and the early lighting companies bases were very expensive. A good majority of people already had their own art objects that they could convert into lamps. Little shops sprung up in cities offering lamp conversions, which consisted of removing the coal oil lamp bits, drilling the holes, and electrifying any object you would like converted to a lamp base. These shops would all offer lampshade frames and/or complete shade kits for ladies to take home and upholster. Merchants would also sell an assortment of prefabricated lampshades, imported or domestically made. As oil lighting started to be fazed out many of the larger companies offered both electrically fitted lamps, coal oil equipped lighting, or would convert the coal oil lamp you purchased from them to electrical. They would always have an assortment of shades to offer you for your newly converted lamp. The lighting companies eventually started making lamp bases that looked like the antiques people were converting, as well as creating new styles for the times. Electrical lighting became its own art form such as, free flowing Art Nouveau. 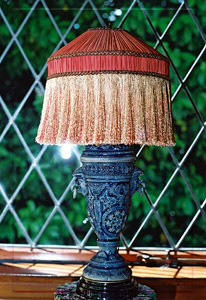 Stylized lamps were made in every shape, size, style and colour. Regardless if your interior was Regency, Italian Pompayian or Rococo, they would build lamps to suite every taste and style imaginable. You can find ads in books, catalogues, newspapers, daily periodical magazines, in fact anywhere light bulb manufactures could advertise, you will find pictures of the early light bulbs. The Thomas Edison Co. was the first manufacture in North America to make light bulbs, all these bulbs were a standard shape in various sizes, wattage and power types (direct current or alternate current). Within a few years, and a few bitter patent copyright disputes, Thomas Edison sold the rights of the light bulb to General Electric; that was the day light bulbs started burning out. Thomas Edison was a crafts person and believed in a quality product and made light bulbs to last. I have five of his bulb and use them every day, they are circa 1884-91, hand blown, hand signed, and dated inside the light bulb on a piece of paper, one bulb has a silk worm cocoon inside the filament support. Once General Electric got a hold of the patent they put in planned obsolescence, meaning, they made the light bulb burn out so you would have to buy more. General Electrics brand name of light bulbs was named Mazda. Early light bulbs came in some amazing shapes. Special art glass molding techniques were used to produce figural bulbs in all shapes and sizes, from ornately blown flame shapes, rosebuds, flower baskets, candles, birds, and religious subjects. These bulbs could be hand painted, frosted or made from coloured glass. Light bulbs from Austria were particularly interesting, their squat shapes or mold blown forms were very unique compared to other North American companies. Some light bulbs had tungsten subjects such as flowers, crosses, love, or Christmas trees, set inside a round bulb with different gasses and chemicals to create an plethora of colours; theses bulbs are still being produced today but are getting difficult to find. An advertisement in a newspaper circa 1905, I saw in my youth stated, "if your light bulb should burn out don't throw it away, just mail it in too us" for a nickel they would (re-charge) replace the burnt out carbon filament. Sadly this service only exists in California by one company that I haven't been able to source out as of yet, but I save all my old light bulbs in hopes of locating this company. If anyone has information about this company please let me know. Women who did needle work at home made their own shades for personal use, or for companies employing cottage industry to produce lampshades. These women were using the finest smocking and needlework techniques known at the time, some silk shades were made in factory settings. One photo, circa 1900s, I saw, was a group of ten Latin American ladies, five on either side of a long picnic table, with three carbon filament light bulbs dangling overhead, they were sewing the same lampshade. This is a style of shade that I have since restored myself. The women were all wearing the same American styled Gibson Girl clothing and hairstyle. This leads us to the importation of silk lampshades, which the Victorians imported from all around the world. The British Empire spanned the world over; they had lampshades fabricated in all their colonies. China was the largest supplier of silk lighting to the west, Japan was second, the British Indies were mostly reserved for the English Empire, and Latin American shades went mainly to the United States of America. All the European shades were unique too their region. French, Italian, German, Austrian, Eastern European and Russian Lamp shades all had their own cultural identities sewn in with the types of fabrics, paintings and sewing technique they used. They used exotic textiles such as imported silks, laces, metallic laces, trims, netting, fringes, and cut sheer velvet, just to name a few. Findings such as fine glass beads, carved bamboo, silk flowers, macram, parchment, gold, silver, and sometimes jewels were used. Made to order lampshades ranged in styles and prices, there are many examples of the same frame covered in different materials and qualities of construction, each designed to suite individual tastes and price ranges. Lamps came as a single lamp or complete suites, like a living room, bedroom, or dining room suite, consisting of 3 or more matching lamps. If you had a grand suite it would consist of floor lamps, wall sconces, ceiling shades, bridge lamps, table lamps, painting lamps. They also had bead lamps, night-lights, candle screens and miniature lampshades. Most earlier suites of lamps were eclectic. The shades were being built to coordinate with the individual's works of art that were being converted into lamps, as opposed to the lamp base being created for the shade. Coal oil lamp shades, circa 1870 to 1890, were quite a spectacle of lace, ribbon and silk usually soft in colour, such as, powder blue & pink, peach, soft greens, soft yellow, grays, and creams. This was due to the limited amount of light that the oil lamps gave. Red, pumpkin orange and forest green were also in use, but became more popular as electricity came into use in the 1890s. This was a major turning point in the design of lighting, before this most shades were monochromatic. The Victorians started to make Polychromatic Diechroic lighting circa 1890. As I started restoring silk shades I took note that Polychromatic shades tended to be Diechroic, this is due to the often multiple colours and layers they used on the lamps. The lining of the lamp shades differed from the silk chiffon over lay, for example, a shade with a powder blue overlay chiffon tends to have a pink or a peach lining, but the top layer may consist of cobalt blue, powder blue, mauve or a dusty moss green. The construction of a shade is a major undertaking. There are multiple layers of no less than three, each lamp shade frame is wrapped with a cloth ribbon, sewn with three to five layers, each over top of one another, in various sequential order to ascertain different effects including the lining. Then you hand sew the trimming and fringe on. The labor on an average lamp shade can take anywhere from 10 hours to 300 hours plus, depending on the size and the difficulty of the top layers of the fancy chiffon work or pleating. 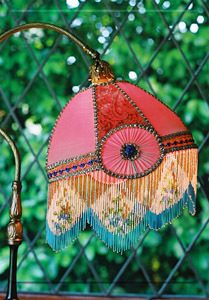 Due to its size, a miniature lampshade can cost as much, and take as long to make as a medium or large shade. The year 1910 brought a new innovation, which was introduced at the Worlds Fair, Rayon or acetate created quite a buzz. Here was a fabric made out of dissolved wood fiber, it was the first time a fabric used a manufactured fiber. Prior to this you would use an all-natural fiber, something that would be harvested from a natural source such as cotton, wool, silk or hemp. This is another way used for dating lampshades. The earlier coal oil silk shades, circa 1870 to 1890, had smocked curtains of silk or a curtain of fine hand made lace, and some shades were nothing more than a smocked curtain of exotic hand embroidered silk. Glass beaded fringe came into use circa 1890, and remained apart of silk shade fabricating thru to 1938. The beads tend to have multiple colours, often exceeding the colours on the shade itself. 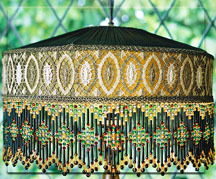 The most expensive lampshades were beaded, some lampshades were in fact just beaded fringe stitched on special frames designed specifically for this purpose. There were many different quality levels of beads: Crystal beads, or beads made in France, German, Czechoslovakian fire polished beads, or tinted (painted) glass beads. Other options to beads and silk curtains were, polished cotton, silk or rayon fringe, both came in two styles, different weights, and many lengths. The first was a chain knit strand, fairly plain, often inexpensive, but sometimes painted with wonderful scenes and patterns. These were light weight usually strand beside strand, it was manufactured and imported from China and Japan. Sometimes when produced in a 2-inch length, it could be very full and heavy with multiple strands piled on top of one another. The second type was a silk spun strand, much fuller than the chain knit strand. They used multi colour striped duel tones; variegated fading from red to black tipped ends or layered monochromatically. They would lay two or three layers of fringe on top of one another. 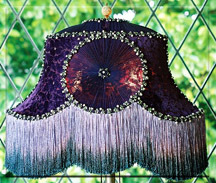 For instance, a lamp that I restored had a three layered fringe consisting of; a pumpkin orange fringe, then an eggplant purple fringe over top, then a third layer of spun metallic gold rope fringe. This was another combination with either a silk curtain or a chiffon curtain hanging behind a single or multiple layer of silk spun fringe. The trims were used to cover the stitched seams where the textiles were applied to the frames. Using the fabric of the lampshade rolled on the bias created the simplest of these trims. The next step up was a cotton gimp, usually plain and inexpensive. Other types of trims ranged from chiffon, up to and including, rayon metallic ribbon, and fine metallic gimps imported from Europe and the Far East. This is one of the biggest expenses when manufacturing shades. Beads are the most costly of the supplies in fabricating, but the end result, I feel, warrants the added expense. With all this said I do not profess to know everything about this subject and I am far from an expert. I am an aficionado of period silk lampshades, always looking to discover new information on this subject. I have had to study and learn how to fabricate out of necessity, because there were no lampshade fabricators who would undertake the restoration process of this early lighting art form, due to cost, skill and labor involved. Many years later, thru trial and error, I have all but perfected my craft and would like to invite one and all to see these 'Jewels of Lighting' as they were once known. I am also in the process of locating a venue for the display of my collection open to public viewing. If you have any information you would like to share on this subject or you have a shade in need of my restoration services, please feel free to contact me. I also do couture designing and recreations of period shades as required. Terms: Monochromatic: the same colour spectrum / may vary in shades of the same colour; Polychromatic: multi coloured/of many colours; Diechroic: to Change colour when lit/to an apposing and or contrasting colour; Rayon/Acetate: a man made fiber spun from wood fiber.